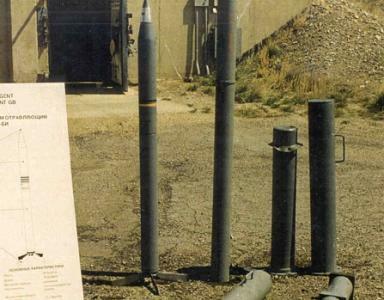 Beginning in the late 1950s, the U.S. Army produced about 478000 rounds of a chemical warfare rocket, which was type-designated as 115 mm Chemical Agent Rocket M55 in 1960. Production ended in the early 1960s. The M55 was a solid-propelled rocket stabilized by four flip-out tail fins. It was packaged in M441 shipping and firing containers, and was fired from M91 multiple rocket launchers. It was designed as a tactical support rocket for the battlefield, and range is quoted as more than 10 km (6 miles). The warhead was an aluminum tube, containing the chemical agent, a central burster tube, and the fuze on the nose. When the rocket impacted the ground, the fuze detonated the burster, which destroyed the warhead housing and dispersed the agent as an aerosol. 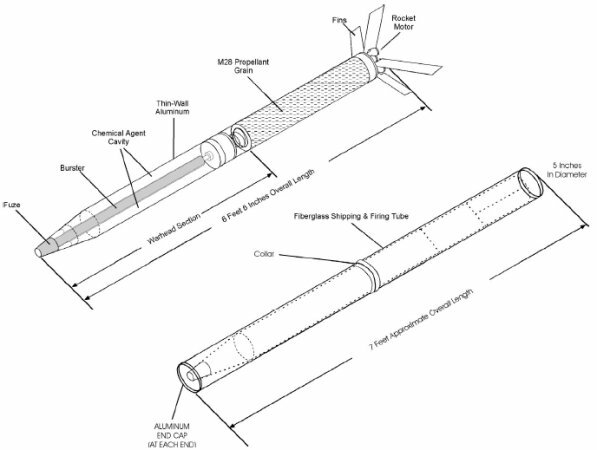 M55 rockets were produced with two different highly toxic nerve agent fillings, GB (Sarin) and VX (methylphosphonothioic acid). The effects of both substances are similar, but VX is much less volatile and therefore more persistent than GB. The Simulant Practice Rocket M61 was a variant of the M55, which replaced the chemical agent with ethylene glycol. It was used for firing training. The Dummy Rocket M60 was a completely inert M55 variant, which was used for training of handling and safety procedures. In the late 1960s, only a few years after production had ended, it became apparent that the M55 rockets would became a storage nightmare. Many of the aluminum warhead tubes were leaking chemical agent, and between 1967 and 1970, thousands of rounds were disposed of by simply sinking them into the deep ocean. However, justified objection against this pollution of the environment eventually terminated this option. The M55 was never used in combat, and in 1981 the Army finally declared the weapon obsolete. However, disposal of the rockets has since become a major problem. Because of problems with the rocket propellant, it turned out that is was not safe to just burn the whole rounds, as has been done e.g. with chemical warfare artillery rounds. This made a more complicated process necessary. In 1985, Congress ordered the DOD to destroy the complete U.S. stockpile of GB, VX and HD (sulphur mustard) chemical weapons. At one time, a deadline of 31 December 2004 was defined for the completion of this task but at the time of this writing, there are still thousands of M55 rockets in storage, because the disposal didn't proceed as fast as planned. To make things worse, deterioration of the rocket propellant (possibly hastened by leaking of chemical agent into the propellant) increases the likelihood of spontaneous ignition.